Venus will appear incredibly bright in the night sky in September, hitting 23 times brighter than the brightest night-sky star, Sirius, in late September. It is the brightest among many bright planets to be spotted this month. Eye-popping Venus, low-riding Mercury and stealthy Saturn will all make appearances among the bright objects in September's night sky, and this day-by-day description shows how to find them. This month, Mercury might be glimpsed very low near the west-southwest horizon while Saturn gets lower each evening in the southwest at dusk. Meanwhile Mars, Jupiter and Venus have crossed into the morning sky, but only dazzling Venus is readily seen at dawn as it rapidly rises higher each morning. It hovers just to the upper right of the waning crescent moon in the wee hours of the Sept. 10. Mars is in the general vicinity, although it glows only a fraction as bright as Venus. During the second week of September, Jupiter appears against the bright morning twilight and becomes easier and easier to see during the latter part of the month. This video explains which planets are visible in the September night sky. Sep. 10: Venus is rising — or might we say "erupting" — into view along the eastern horizon at the break of dawn at the start of the month; it comes up earlier in a darker sky as each day passes. It will shine at its greatest brilliance (an eye-popping magnitude -4.8 on astronomers' brightness scale, which is 23 times brighter than the brightest star in the sky) on Sept. 20, and by month's end it rises more than two hours before dawn’s early light. Recall that Venus was at inferior conjunction on Aug. 15, in line between the Earth and sun. Now it is swinging away from that line, speeding ahead of the Earth in its faster orbit. So in a telescope it displays a large, brilliant, beautiful crescent that waxes in phase all month while shrinking in size. 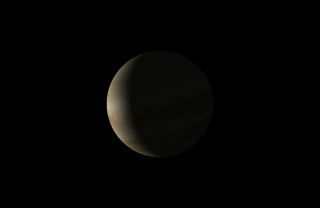 Early in the morning, a narrow crescent moon can be seen sitting about 2 1/2 degrees to the left of Venus, while about a half dozen degrees to the left of the moon sits orange-yellow Mars shining at an unusually dim magnitude of 1.8. In all, a gorgeous eye-catching sight to start the day! Sep. 18: Saturn, in Libra, is relatively inconspicuous in the southwest when night begins. It is only about half as bright as it was at opposition last May, but still slightly brighter than Antares, the heart of the celestial scorpion Scorpius. This evening Saturn can be found about 2 1/2 degrees to the left of a crescent moon. Saturn spends September drawing closer to Antares and by the end of the month will be 11 degrees to the star's right. Sep. 25: Mars glides 0.8 degrees to the north of the first magnitude star Regulus; the Red Planet is then half a magnitude fainter than the bluish star. The contrasting duo is 11 degrees to the lower left of Venus and 10 degrees above and to the right of Jupiter. Editor's note: If you capture an amazing view of the moon, planets or any other night sky view, and want to share it with Space.com for a story or gallery, send images and comments in to managing editor Tariq Malik at: spacephotos@space.com.